Sometimes it can be helpful to visualize a third dimension by the color of the line in the plot. For example in Fig. 1 you see a logarithmic sweep going from 0 Hz to 100 Hz. Here the frequency is decoded by the color of the line. This can be easily achieved by adding a lc palette to the plot command, which uses the values specified in the third row of the data file. The palette can be defined as shown in the Multiple lines with different colors entry. But it can be set in a more easy way, by only setting the start and end color and calculating the colors in between. 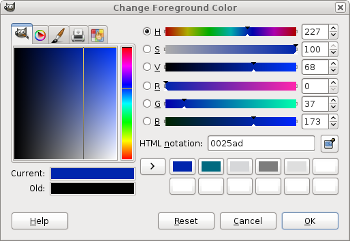 Therefore, we are picking the two hue values in GIMP (the H entry in Fig. 2 and Fig. 3) for the starting and ending color. Fig. 2 Picking the HSV value corresponding to the given color of #09ad00. Fig. 3 Picking the HSV value corresponding to the given color of #0025ad. These colors are then used to specify the palette in HSV mode. The S and V values can also directly be seen in GIMP. Excellent! This was extremely useful, thanks! I am new to GNUplot and I was wondering, is it necessary to setup 3 columns of data. I am trying to setup an xy plotted curve using the color gradient similar to the above graph. Low values will be green, while high values will be red. Is there anyway to set the start and end values for just the y-values? Thanks! This really helped! I am a student who is helping a friend with a report and this made things so much easier. I was wondering, could i have three curves with lc palette with three different dashing styles one the same plot? It doesn’t seem to work. The problem could be your terminal, because dashing is not working with all terminals at the moment. How is it possible to make these palettes transparent in order to distinguish and see highly overlapping functions or data? I’m not able to use dashed lines and lc palette at the same time. It all works fine if I only have a small set of points, and each straight line segment gets dashed. But if I have many points as a smooth curve, I guess gnuplot makes dashed lines between segmetns of the same color… which are tiny, and leads to continuous curve. Can you try this with our logarithmic_sweep.txt? Pretty much the same code you have above, but in term wxt or epslatex. I get the same result. Dashed lines in gnuplot is in general a little buggy. It is not the first time that it didn’t worked. Thanks a lot, for your time and your excellent job, and congratulations for the web site. I found very useful this entry ! Do you know if there is way to use ‘lc palette’ with the ‘filledcurves’ option ? I’m triying to fill histogram-like bars, but instead showing the frequency through the height I want to do it through the color. I’m stacked. Yes, you can do this. I’m preparing a blog post about this topic at the moment. where the third column of the data file is used for the coloring. Thank you Hagen for the quick answer, but it didn’t solve my problem. In fact, I confess I don’t see why to use the second argument of ‘using’ as you do. The problem is that for ii=0 it does take the proper value of the intensity, but from there on, all the other bars are filled with the same color. Any idea about what is going on ? Thank you againg and sorry for bothering. If you want to plot a function and modify its color by another function (for example frequency or time or …), you could do it with the special-filename property. 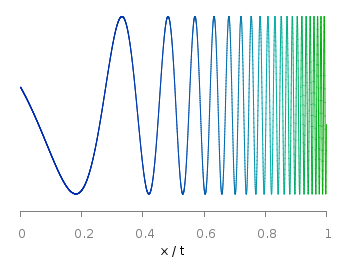 Here the color of the line is given by the value of x, the result is shown in Fig. 4. You can modify x with a function g(x) by u 1:(f($1)):(g($1)). For your purposes it is better to directly apply the boxes plotting style. Your data can then look like this. 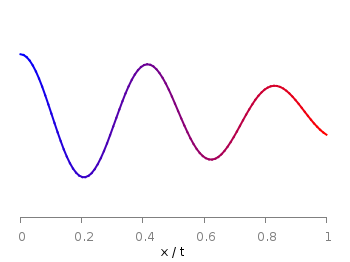 The plot is then created with the lc palette option and the result is shown in Fig. 5. Thanks Hagen. Looking further for the coming up tutorials! I was wondering if it is possible to do this with SPLOT using 6 rows (x, y, z, dx, dy, dz=color) with vectors. I am trying to do something like this, but it seems that the 6th row doesn’t matter. echo "splot [0:64][0:32] \"$i\" using 1:2:3:4:5:6 with vectors head size 0.1,20,60 filled lc palette"
Do you know where is the problem? I was trying to get something along the lines of your Fig. 5 plot, using gnuplot 4.2 (patchlevel 6), but while I do get the correct colors as indicated in my third column when using lines or points, when I try boxes the palette takes the color values from the first column of data (which is instead the height of the boxes). Any idea what’s going on? may it be a version related problem? Please try if you can reproduce Fig. 5 by the gnuplot script and data given in the figure caption. If not then it is most likely a problem due to your gnuplot version. all I want to do is, if the value is 20 yellow and >50 red. How do I do this? Once again thanks for all your tips! thanks for your nice words. Don’t worry, I’m not very active here at the moment, but the page will be available during the next years.